The installation with creative collaborator Ali Brown, and Megan Clarke-Bagnall. The pompoms were a community group initiative, and the space was used by story tellers and musicians. Bryony Kimmings and Taylor, performance artists being "Credible Likeable Superstar"
Crafts in the Grub Hut... skull candles and Offrendis for Day of the Dead ... and a bit of gold panning in the river with pirate pouches for the treasure! The Heroine Collective website is live! Working with lead artist Ali Brown and Helen the Storyteller to provide a sensory workshop for dementia care patients with my old friends the nests!! 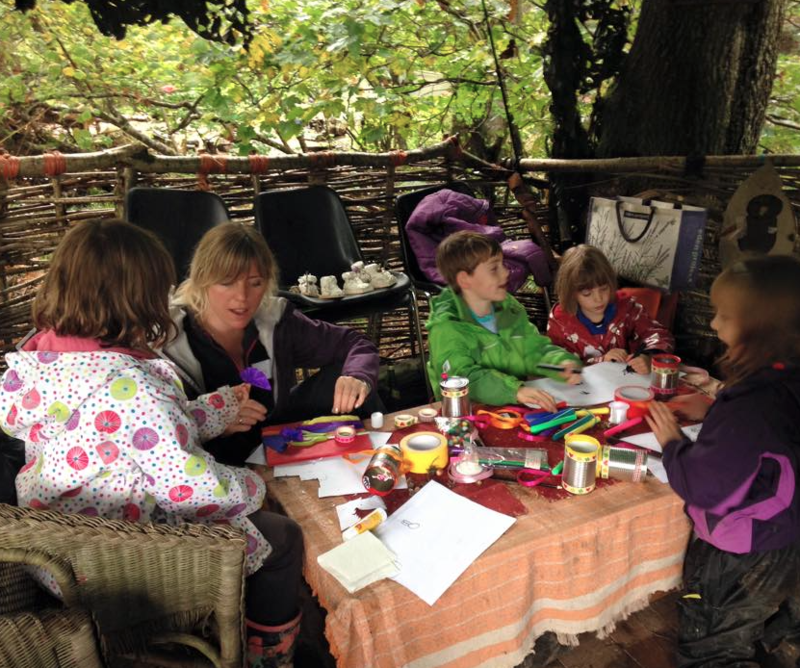 First day of forest school involves some quiet craft space as a retreat from the frantic re-aquainting with all the woodland playground! First try out for the Earth Angel chair... I seem to have mostly photos of the kids here, but people were getting involved all weekend. Wooden chair with wood-base wings shaped and covered in sycamore seeds. BBC write up on exhibition with my genitalia props!! I spent the day at Burghfield atomic weapons factory with blockading activists, who were very obliging to help me out with one of my questionnaire projects. The complete set is on display now at Kebele community house,Bristol. Celebrating today Lucy Anne Holmes who started the No More Page 3 campaign. An early release piece from my illustration project for The Heroine Collective...an upcoming online publication this spring. Genuinely the nicest robot I could hope to work with... Here he is with his bespoke, Made by Carrie Alpine horn, thats my kind of brief!!! Just finished 5 months on Casualty running around with this lot. Such an ace team of people, working in Wales rocks!